45 foot cruising circumnavigator designed for (and with) architect Geoffrey Palmer. Hull and deck built by Concordia Custom Yachts and completed to a high standard by her owner. Launched in late 1993, and has cruised the Mediterranean and Caribbean. This very special boat has to be seen to be believed. PLANS AVAILABLE! Geoffrey Palmer is a successful architect who gave up his practice to circumnavigate in his 41-ft Rhodes Reliant, “Windigo,” between 1986 and 1989, covering 35,000 miles. During that voyage, he pieced together the elements of his ideal circumnavigator. In 1991, he brought those ideas, in the form of a model and priority list, to us. We did the Naval Architecture, structure, rig, appendages, machinery layout and general engineering. 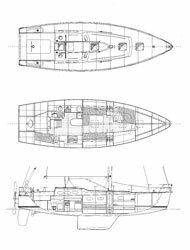 The interior, systems and “styling” of “CETACEA” are of Geoffrey’s design. It has been a most enjoyable collaboration. This is a tropical cruising boat, so the cockpit is a large living area, comfortable for entertaining around a generous removable table under an awning, and is well-designed for offshore use. Drawings do not show how light and cool the interior looks as you enter the main companionway. The area as you enter the boat is raised over fuel tanks and batteries, with a 360 degree view through oval windows, a shape repeated in the saloon hull windows and throughout the boat. The interior is painted a cool white with a light grey sole and light varnished wood fiddles and facing boards. To port aft, in the raised area, is the head, with the galley forward of it. To starboard aft, there is a pipe berth, and forward of that a long navigation/draughting table (an architect’s detail). The saloon is forward and nine inches lower, with a big drop-side table and a pleasant view forward through twin curved ring-frames fore and aft of the mast, and a view to port and starboard through oval hull windows. There are 135 gallons of fresh water under both settees, and an 80-gallon diesel tank under the raised area below the companionway. There are sloped bookshelves outboard and “end-tables” built in forward of the settees. The Owner’s cabin is forward with a double berth to port and a 6′-6″ long dressing/work table to starboard, echoing the draughting table aft. Following our BOC boat practice, there is a watertight bulkhead forward of the Owner’s cabin, with a watertight door leading to the fore-peak, where “emergency” pipe-berths share space with the sail and chain stowage. The Yanmar 50hp engine is aft, under the companionway. Systems are simple, foot pumps for salt and fresh water, no refrigeration. There are large cockpit lockers aft, watertight to the rest of the boat, and a lazarette containing the life raft at the stern. The winch islands act as dorades for engine air supply and exhaust. The autopilot and steering systems are below the wheel, and a Monitor steering vane is fitted. Most of the mast and sail controls come back to winches and jammers on the cabin top each side of the companionway hatch, and inside the dodger. Deck hardware is by Antal. 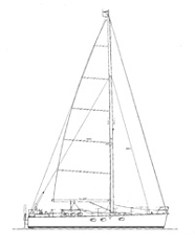 The rig, built by Metalmast, is a simple cutter, with Profurl furling on the headstay, and hanks on the innerstay. Chainplates are full width to reduce mast compression and rigging sizes, so the jib is non-overlapping. Mainsheet tackle is on top of the house to allow an awning, and keep the cockpit clear. Winches and windlass are by Lewmar. The hull and deck were built by Concordia Custom Yachts, and are made of biaxial and unidirectional E-glass over an Airex hull core and a Divinycell deck core, with vinylester resin. The rudder is an E-glass spade on a carbon-fiber stock. The interior and joiner work were built by the Owner. The end result is an harmonious, strong, buoyant home for world-wide voyaging.